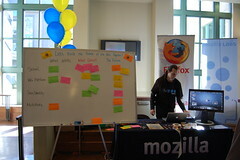 This weekend I represented Mozilla at the >play Expo at the Haas School of Business at UC Berkeley and the San Francisco Green Festival. 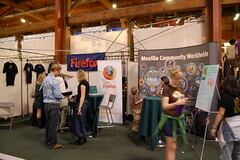 This was the first time I’d ever represented Mozilla at a public event, so it was quite a learning experience. It was also fun trying to get an idea of what an individual was interested in and connecting it with something relevant about Mozilla. Almost all of my conversations ultimately resulted in the question of how Mozilla makes money, to which I gave them the standard profit-sharing response. Sometimes this segued into an interesting conversation about what the Mozilla Foundation was, since many people didn’t know that Mozilla was a non-profit at its core. Aside from that, I also explained what some of the Labs projects were and demoed them. Virtually everyone we met had heard of Firefox, and many of them already used it, but few of them knew about the Foundation or Labs, so it felt good to educate people on these topics. This was the more fun of the two, largely because it seemed rife with idealists who either hadn’t heard of Firefox or didn’t know that it was backed by a non-profit foundation (and that its for-profit subsidiaries were wholly-owned and had no investors). I wasn’t there for very long—only an hour and a half at the tail end of the festival—but I’m pretty sure that I turned at least two people on to Firefox who had never heard of it, and that felt really good. Most of my conversations with people included some sort of abbreviated form of my What Mozilla Means to Me blog post, which was very well received. In particular, given the context of the Green Festival, I tried relating the Mozilla Manifesto’s view of the Internet to the way that many environmentalists viewed the environment: as a public asset and a public benefit, and—in the words of one person I talked to—“something that needs to be saved”. One frequent question asked of me was “how is Mozilla green?”, to which I had to respond honestly that I didn’t know, mostly because I didn’t actually know what the word “green” meant. I told them that I did read Michael Pollan’s The Omnivore’s Dilemma, though, and that the history of the word “organic” did resonate with me. The origin of the organic movement from the 1940’s to the 1960’s, as explained by Pollan, was something that featured a heavy focus on community and genuine social relationships between producer and consumer—concepts that Mozilla shares, but that have since been excised from the word’s meaning since it was embraced by capitalism over the past few decades. While the word has recently been used for marketing Firefox, it’s a term that I’ve heard used informally to describe the bottom-up, participatory approach that we try to foster when developing experiments in Labs. After explaining these things, the people I talked to—at the very least—seemed to walk away with a much better impression of Mozilla. It was particularly exciting to talk to folks who hadn’t heard of Firefox, because when I talked about how all of these “organic” ideals fostered more secure, more responsive, and more user-respecting software like Firefox and its addons, they really seemed to get it.